Jami Nato is a blogger you need to go e-meet immediately if you haven't already. I met her in real life (a la #influenceconf) before I read her blog. I heard her speak and did a lot of laughing and a lot of crying. She is this cuter cooler version of Kristen Wiig that speaks a lot of truth. She shares real life on her blog and isn't afraid to talk about the hard stuff. 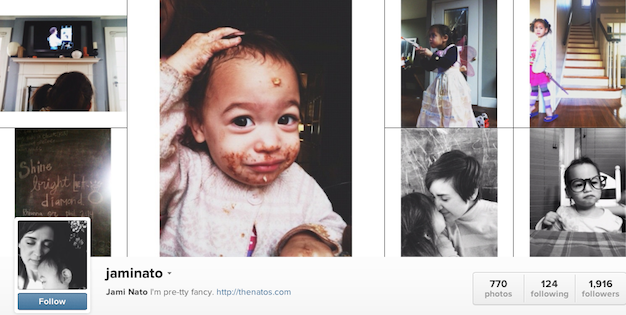 But she shares a lot of fun beautiful stuff too -- like her oh-so-cute family and easy DIY and recipes. She is super down to earth and approachable. Dear Jami, won't you be my neighbor? Anywhooo... go check out her blog. And check out her instagram too. She is doing a hilarious fun competition/linkup today. #Letsgetpraisy -- where you write out lyrics from pop/rap music and pull it into a scripture reference. hilarity. awesomeness. Mine is up top -- bed intruder viral youtube song meets exodus 2:3. Anywhoooo... go meet this lady. This video was my first introduction to Jami and her family. So we are on equal playing ground, you should have to watch and cry and smile your way through this too. Such a great story of God's redemptive grace. A new perspective on life and relationships. And P.S. If you do any sort of "thankful" post this week -- Rach & I will be hosting a "thankful linkup" on Thursday. Love jami!! Hey will you go to her #letsgetpraisy post in her blog and leave a comment that you like number three? I need votes for the competition. Thanks. Xo! This is TOO FUNNY! I've been following the letsgetpraisy competition and it's turning out to be so much fun. This one made my night! i know! i've been having so much FUN laughing at them all. plus it is such a great way to turn your mind turns thinking about scripture more! LOL! Yep - yours is by far one of my favorites! Gosh, I am totally laughing my booty off at all these links! XO! What's hilarious is that I was in bed and thought of it... Got up and snuck into my baby's room for the chalkboard at like midnight and did it. All of them are so funny! alrighty, you and 5ohwifey had the most votes and are up against each other on my instagram TOMORROW! can't wait!!! also, this post was super sweet. you are so freaking great.